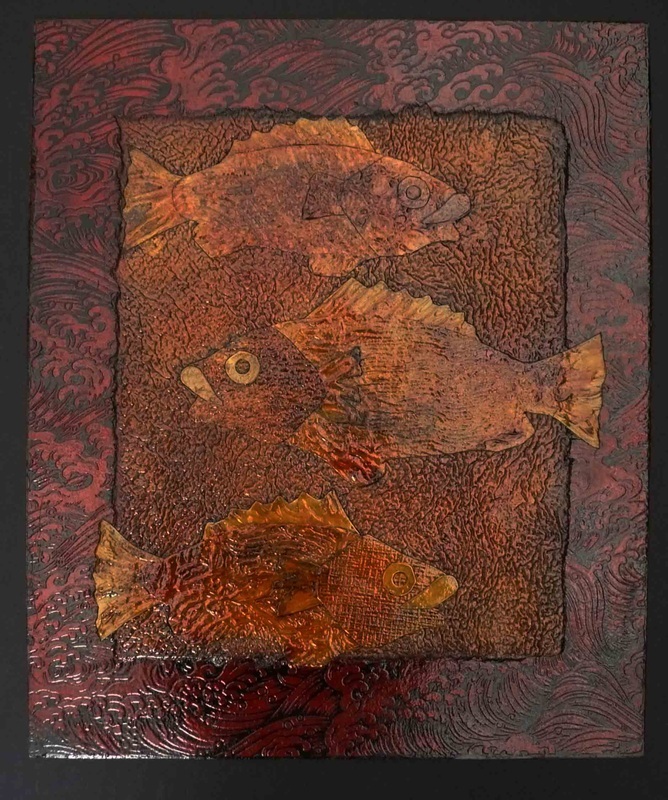 The Collagraph technique is essentially an experimental and inventive form of printmaking which uses a variety of textured materials glued to a cardboard or MDF board as a base to create a low relief or incised block. 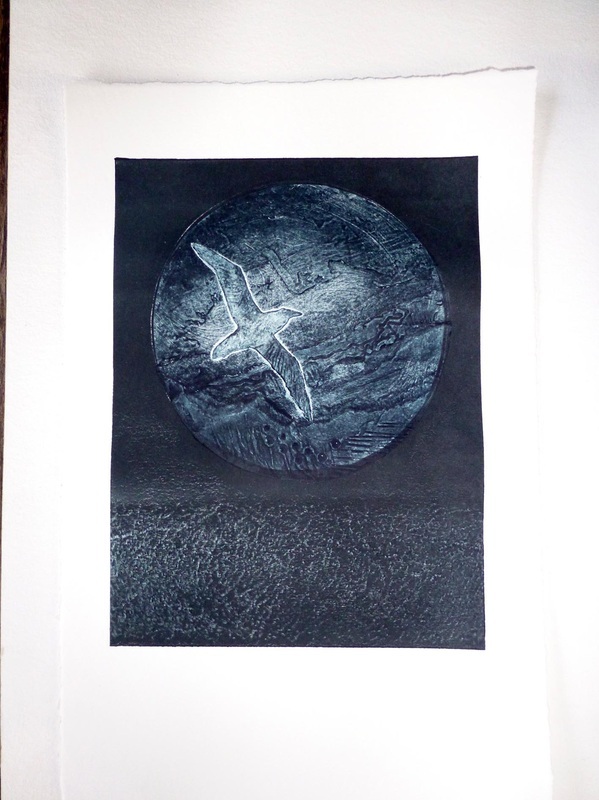 The block is sealed, dried, then inked up like an intaglio plate and printed on dampened paper through an etching press. 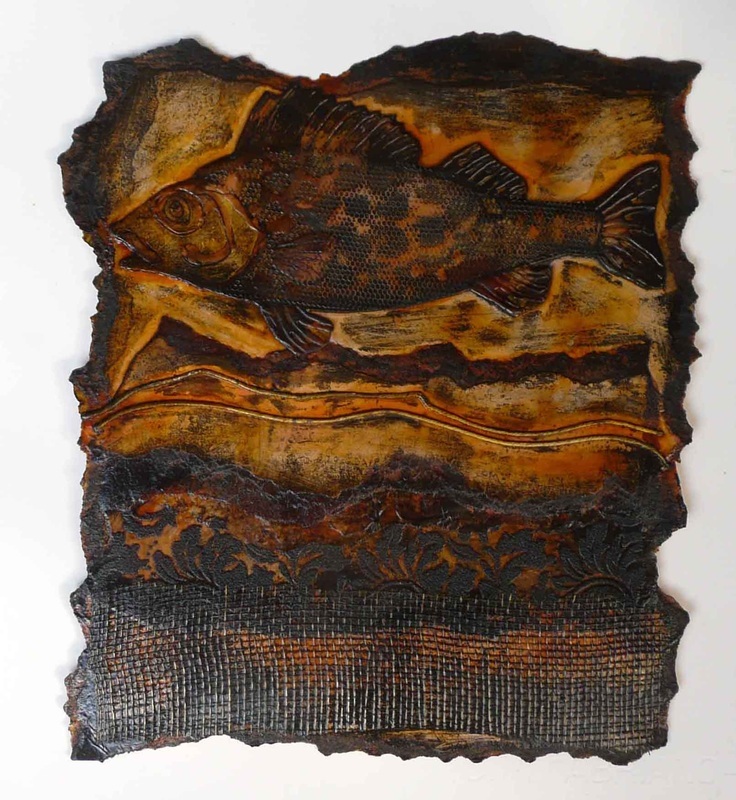 The Collagraph block or matrix can be made up of materials as diverse as scouring pads, wood shavings, tea flakes, sand paper, wall papers, wool/string, tissue and flocked papers fabrics, lace, mesh, feathers, modelling paste, and the list goes on. You can easily be seduced by textures and there is an element of surprise because of its experimental nature. My subject matter is varied depending on the types of surfaces I collect and create. I am forever experimenting and exploring this technique. I made this printing block or matrix (Owl with Egg) from a card base. I then glued wall paper cut pieces with PVA. I then used PVA to add details and I allowed it to semi dry so I could incise into it. I added fine Carborundum onto the glued areas where I wanted dark inked contrast i.e. the claws, the eyes and in the dark areas of the body. When my matrix construction was finished, I applied several coats of Shellac ( a mixture of methylated spirits and shellac flakes to a runny thin honey consistency), allowing sufficient time to ensure each coat is thoroughly dry before adding another. The next day the matrix was inked up with Akua water based inks, rubbed back with Tarlatan, placed on the press and dampened Fabriano Rosapina printing paper placed on top. The press blankets were placed over the top and the press adjusted to the correct rolling tension and the image was born. Later I experimented with Chine Colle - the application of thin tissue in a layer, sandwiched between the print and the paper. Rice paste was used to adhere the tissue to the print. 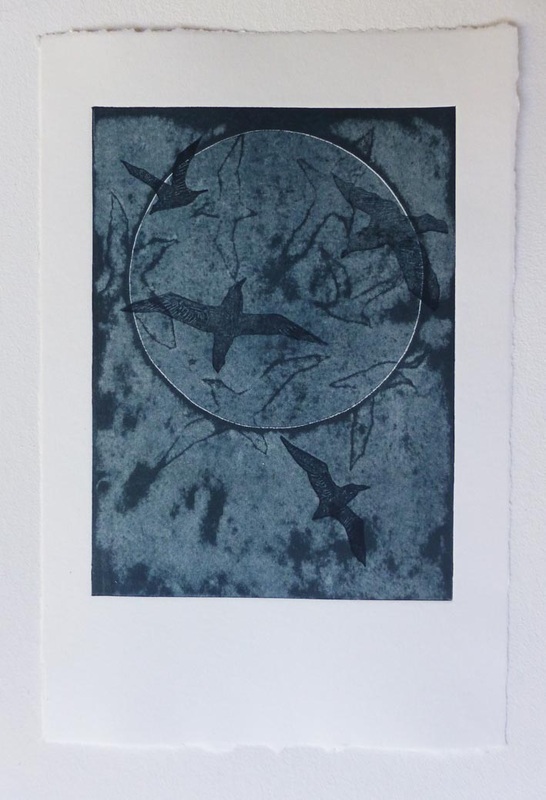 The Australian Raven blocks are well worn through the print process. They have their own unique appeal. I cannot part with them. 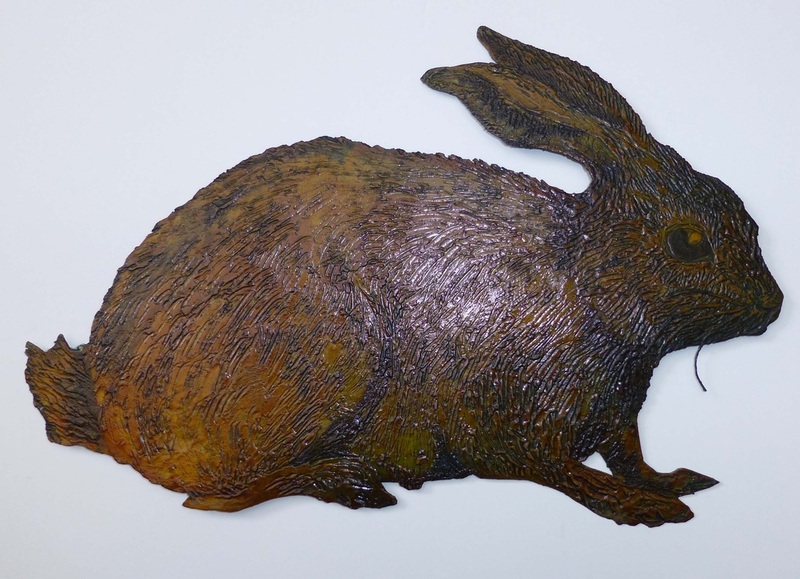 The Rabbit matrix above is made with a sculptural medium/paste on card with carborundum powder applied to create darker contrast. RHS... Prints created from this matrix using relief, collagraph and ghost printing techniques.